There's also a lot of chat over what happened during Wednesday's finale. Did Ricky have a chance after having to personally evict three people in twenty minutes? Was Lolo correct in her anger about being evicted? Did Tamar deserve the win? And, maybe most importantly, what did Lindsay Lohan think of her mother's time in the house. Obviously, we had lots to say about all of this, along with our overall opinions of the season. Was this a successful season? Will the show return next January? We cover all of this and so much more! We thank you guys so much for being a part of our show for this short season. It has been so much fun. We will be back this summer as usual for our regular Big Brother Gossip season. Oh yeah, and it also helps us out a lot if you do some simple little things like retweet this post, or any post about the Big Brother Gossip Show. Or if you're a member of our Facebook group, hit that little share button. You can find this show at all of the various podcast sites, or click here for a direct download! As we stumble to the finale of this Celebrity Big Brother season it's become clear this is a house full of nutjobs. Lolo is psychotic. Tamar is crazy. Dina is nutty. And Tom is just goofy (or is he more than that?). It's a dramatic week in this short season as we went from 8 houseguests at the beginning of the week to a final five that will make it to the finale. Who has a good shot at taking the big prize? We analyze the chances of each of those finalists, and everything else that happened in the house this week. The gang is back together, and tonight we give you all the info you need on everybody in the Celebrity Big Brother cast. If you haven't heard of any of this year's cast, this is the show for you. We also chat about the house layout, and critique the two live feed leaks. Do we know who is the current HOH? Possibly. Listen to the show and decide for yourself! 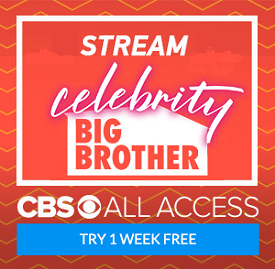 There certainly cannot be another season of Celebrity Big Brother on CBS without commentary from Mike, Colete, and Scott. The gang is getting back together with weekly shows commenting on the latest news from inside the house. The cast was announced earlier this week during the Patriots/Chargers NFL playoff game. Are some of them not familiar to you? Well that's what this week's upcoming episode is all about. We'll give you the backgrounds on each and every one of them, and offer up some predictions on whether we think they'll do well in the game.To listen live head to our mixlr site this Saturday night at 9 pm ET. As you wait for this new episode, please give some thought to being one of our lovely patreon supporters. We offer a number of special perks to contributors, including access to Scott and Colette's "Day Drinking" show. Yes, that wacky pair has a few drinks and chats about classic movies and other TV shows. Click here for more info! We're really excited for this season! We here at the Big Brother Gossip Show truly loved this season so we decided to actually do a postseason finale. We chatted about everything that happened during the 90 minute CBS broadcast, and we have all sorts of suggestions for future season. We also have a tons of opinions about various aspects of this season as a whole. Was Tyler robbed? Would JC had won if he made the final two? Will Angela and Tyler last? Will Snoggy and Bayleigh make it? More importantly, are the rumors true about her being pregnant? Obviously, we also have a final goodbye to that silly little woman named Sam. This has been so much fun this season. The feeds were great, and this cast gave us all kinds of material to work with. Unlike previous seasons, we actually like the vast majority of these people, and it certainly influenced our episodes this season.